St. Cloud Window Inc. proudly featured the SCW 3530 Tilt-Turn window at the 82nd annual American Institute of Architects (AIA) Minnesota Convention & Exposition. The SCW3530 Tilt-Turn window provides the option for two open positions with one handle controlling all operations. With a simple 90-degree turn of the handle, the tilt-turn hardware allows the window to tilt inward at the head, for secure ventilation and worry-free protection from the elements. Alternatively, turning the handle 180-degrees allows the vent to swing inward like a casement window for easy cleaning or a full breeze. Turning the handle to the downward vertical position securely locks the vent with a full compression seal. 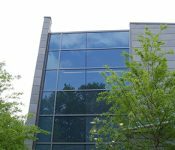 Tilt-turn windows are quickly becoming the preferred choice for many commercial applications including high and low rise housing, hospitals, education, government and military buildings. As with all St. Cloud Window products, quality and testing are paramount. All products manufactured by St. Cloud Window are engineered and tested to meet the highest standards for acoustic performance, energy efficiency, water penetration, impact resistance and security. TILT – The tilt position tilts the top the window sash inward which sets up a nice convection flow of fresh air. In the tilted position, the limiter arm restricts the maximum opening to 4” with the security of locking points still engaged. TURN – The turn position swings the window sash inward to provide controlled ventilation, easy access for cleaning, and egress in the event of an emergency. FIXED – In the fixed position the window is simply an aesthetically pleasing window. The compression-seal locking system around the entire perimeter of the window sash ensures a weatherproof seal in even the harshest environments. 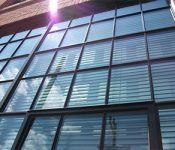 Visit the Products page on www.stcloudwindow.com for full SCW 3530 Tilt-Turn window specifications and product details. St. Cloud Window — let us help you achieve your vision without compromise.